At StoreMoreStore, we help companies of all sizes in all industries organize their files and documents more efficiently. This means we’ve got to have many different solutions up our sleeve. Some companies are ready to make the leap from filing cabinets to open file shelving with all the great color coding end tab labeling options that go with that file system. However, sometimes customers want to capture space savings and organization benefits without spending all the time to completely convert their existing files to a color-coded labeling system. If you do a full color-coded file conversion, you have to buy new folders and color coded labels for every single record in your organization. Then, there’s the time it takes to physically remove documents out of the old folders and into the new ones. Some companies find a full file conversion too time consuming, costly in terms of materials, and disruptive to the normal flow of work. Although color coded side tab filing systems are great and very easy to use, there’s another effective option you may want to consider. It’s called Oblique Direct File Transfer. 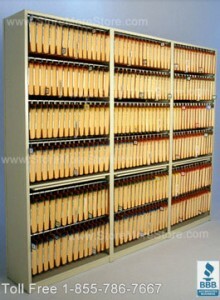 This is a file system that uses open shelving with box bottom or “V-based” hanging compartments. 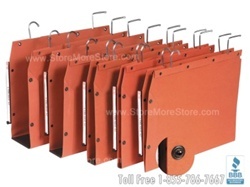 These hanging compartments operate much like top tab Pendaflex®files, but have a magnified view lens on the side of the hanging file pockets instead of the top. This allows you to store your traditional top tab manila folders into vertical shelving units without any alteration to the current folders or contents. Implementing a Oblique filing system requires very little time and effort on your part. The Oblique file system offers three levels of indexing to help you narrow your search for documents down to within a 3″ to 4″ area very quickly. This improves the time and accuracy to retreive and refile documents. Your hanging pockets can be lableled at the factory and shipped to you ready for instant setup. We believe that saving space is one of the smartest ways to help our customers reduce energy costs and save money. Directly transferring office files into a perfectly organized open shelving system means you could fit three times the number of files into half the floor space required with lateral or vertical drawer file cabinets. Interested in a complete Oblique filing system including shelving and labels? Click here to request additional information or call us toll free at 1-855-786-7667. We’re here to help make file organization easy! Are Classification Folders Worth The Extra Money? Folders aren’t a high dollar item, but when you buy hundreds of them at a time, the expense can add up. If you’re organization works like most companies today, you look for the least expensive tools that will let you get the job done. For some filing jobs, that’s just a plain 1/3 cut folder with basic labeling, however, sometimes penny pinching with office supplies can lead to wasted productvity dollars from inefficient work processes. 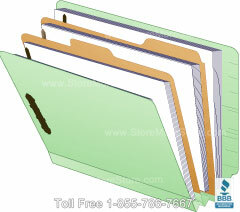 Internal File Dividers Make Finding Documents Easy! 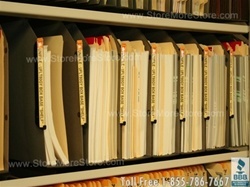 At StoreMoreStore, we offer lots of end tab folders for open shelf filing that let you quickly find the right file. But it’s not uncommon to open a folder and find dozens of pages that are just stuffed in there in no discernable order. Sifting through to find the exact page you need could take way more time than you want to spend. Using classification folders with internal dividers keeps documents well organized for optimial productivity and secure to ensure records are where they are suppose to be. Human Resources is a great example of a department that can benefit from better classification of records. The first section in each employee folder could be devoted to basic information and forms such as emergency contacts, W4, policy acknowledgements, and so forth – with the most current versions on top. The next section could be for benefits enrollment and participation information. The third section could be reserved for performance evaluations and disciplinary actions. The fourth section might be the right place to store any FMLA or WC paperwork. Construction project files and legal files could have documents segregated in a similar manner based on date, type, or other criteria. At StoreMoreStore, we’ve got classification folders with one divider or two so you can choose how many different document sections you want to create within a file. When your information is well organized, your employees can access the papers they need easily, to provide more efficient customer service to clients. The best application for classification folders are where information is accessed frequently and/or kept for a long period of time. Classification folders can withstand heavy useage and be reused when a project becomes non-active and moved to long term storage. 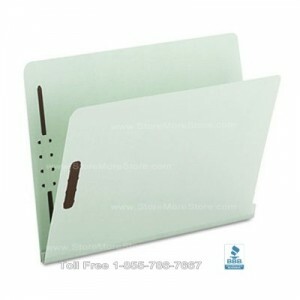 We’ve got the lowest online pricing for these high quality folders, so you can save money even when you spend more than usual to get the best supplies. 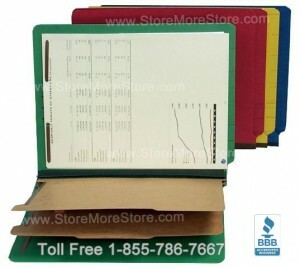 Pick up these classification folders today at StoreMoreStore.com!